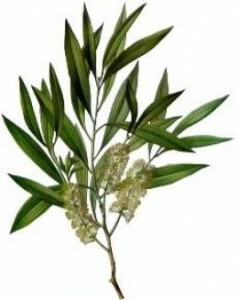 Tea tree oil is extracted from the Melaleuca tree. Its name was coined when the leaves of this tree were used for tea. But don't be mistaken in thinking you can drink or ingest the essential oil of tea tree. For external use only, tea tree must be diluted in a suitable carrier oil to concentrations of 5% or less to be safe.Tea tree has a number of healing benefits. Potent antiseptic properties make it a fine healer of small wounds, insect bites and boils. The antifungal and antibacterial action of tea tree treats acne (comparable to benzoyl peroxide, with a slower effect), has the ability to kill Candida and when inhaled helps to treat colds and coughs. Some research has shown that tea tree could act as an anti-viral remedy for the Herpes virus - that's cold sores, chicken pox and warts included! When it comes to cosmetics the anti-inflammatory tea tree alleviates skin impurities and in shampoo acts as a good dandruff treatment. As an ingredient in mouthwash tea tree oil can relieve bad breath and help prevent gum disease. Other health and beauty products in which you can find tea tree include soap, hand wash, cleansers, make-up blemish sticks, lip balms and household cleaning products.